Plagiobothrys reticulatus (Piper) I.M. Johnst. Habit: Annual, +- strigose. Stem: decumbent or sprawling to erect, 1--4 dm. Leaf: cauline, lower 3--8 cm. Inflorescence: bracts below middle. Flower: calyx 2--4 mm, appressed- to spreading-hairy; corolla limb 1.5--3.5 mm diam, appendages yellow. Fruit: nutlet dull, brown to gray; abaxial ridge rounded, lateral ridges +- 0; adaxial ridge in trough; scar oblique, narrow-elliptic to triangular, concave, sunken. 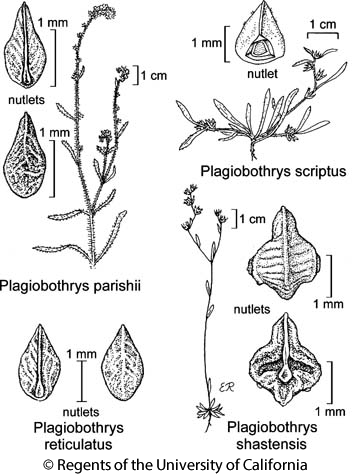 Citation for this treatment: Ronald B. Kelley 2012, Plagiobothrys reticulatus, in Jepson Flora Project (eds.) Jepson eFlora, http://ucjeps.berkeley.edu/eflora/eflora_display.php?tid=38520, accessed on April 21, 2019.